A 61-year-old retired English teacher from Shenyang, the capital city in northeast China's Liaoning Province, has given children free English lessons since June this year to cultivate their interest in English. Bao Han, 61, lives in a community called Xinjiapocheng in Shenyang. Since this June, she has taught children English for free from Monday to Friday in the community's square. In each lesson, she would teach one to two words and some simple sentences. Considering the fact that most of the children are less than three years old, she teaches for 20 minutes each time to keep their attention. Her class is so lively and interesting that it has had over 70 students. Bao also has a little teaching assistant, her grandson, who's named Yiding. Although Yiding is just two and a half years old, he can speak in English fluently thanks to learning from his grandma. Yiding's strength in English has made him a familiar name in the community. At 9:30 a.m. each day, Bao is surrounded by dozens of children sitting in baby carriages accompanied by their grandparents. To encourage the small kids to speak in English with confidence, she looks them directly in their eyes by kneeling down, which inevitably adds pain to her waist where she suffers from lumbar disc herniation. In spite of all this, she persists in teaching in earnest. "I am touched by Bao's meticulous attitude towards teaching. She even prepares toys and teaching aids herself to increase children's interest in studying. My grandson can focus his attention on Bao's teaching, but he cannot do so in early education lessons elsewhere," said a senior surnamed Wang. "We elderly also learn together with our grandchildren in Bao's class, so that we might be able to speak English in our future trips abroad," said some seniors. Young mothers are also grateful to Bao for her teaching. "Her English teaching has piqued my child's interest in English. It is so interesting to see so many kids learn English together," said one of the young mothers. Bao is gratified by her teaching. "I am glad to see I have ignited so many children's interest in English study and their courage to speak in English has given me a strong sense of fulfillment," said Bao. "Through my English class, folks in the community gather together and gain both knowledge and friendship. 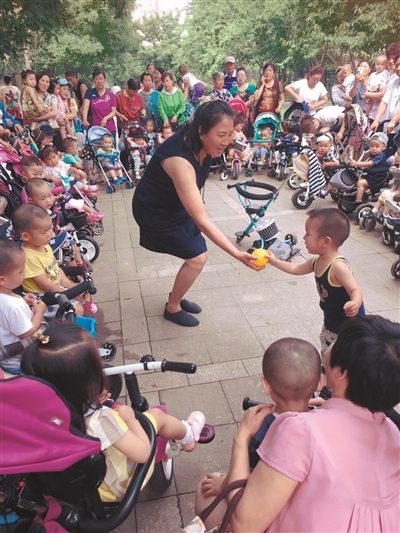 It is not an easy task for seniors like me to look after children, and I'm hoping to find more happiness and greater significance from what I am doing even at such an advantaged age," Bao continued. As it is getting colder outdoors, Bao has decided to give English lessons each Monday, Wednesday and Friday this month. Now, people in the community cherish the same wish that there can be an indoor room available to the children and the elderly so that they can study more comfortably for 20 minutes even in cold weather.